the users needed to be able to download archived files. So, at the beginning of this saga I went on the search for a jquery library that would allow me to list a folder structure. I found many libraries out there but they all seemed to be targeted a local file storage or were way over kill for what I needed. I eventually stumbled on https://www.jstree.com/. The library had most of what I needed, it took in Json and would display the resulting structure. It looked perfect. The next step was to begin creating a service that I could call from ajax in order to return the json to jsTree. Easy Peasy... or so I thought. 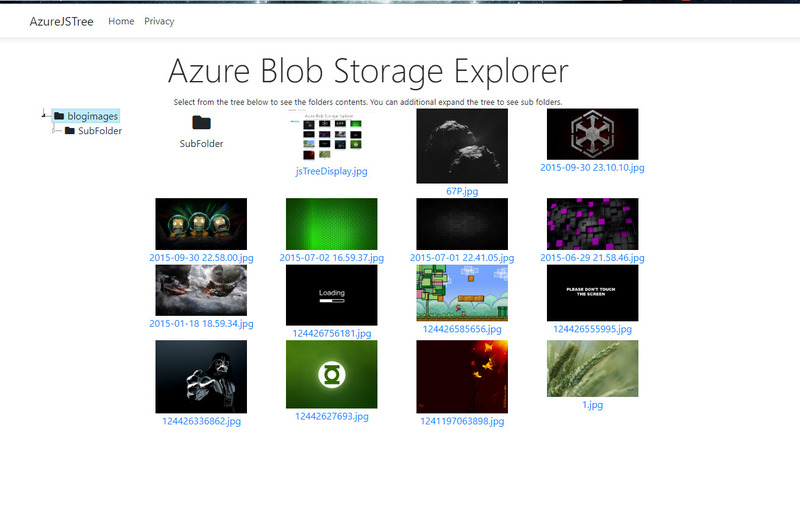 Microsoft provides a library for accessing Azure Blob Storage, however I wanted a simple reusable class that would, eventually, allow for uploads, downloads, as well as the file browsing functions. I created the below interface and class. After looking at the code above, you must be beginning to wonder why I have dependency injection built into my Storage Service if I had written this for .net framework. To this, I must confess I have rewritten my solution for .net core so that I could use it for other projects. In order to really simplify my life, I am creating the storage account and blob client references as class wide variables. This allows me to reuse them for multiple tasks if necessary and not reinstantiate them for each method, which is how must of the documentation online has structured things. Now, for the connection string, you will want to pull the connection string from your storage account in azure, I am assuming you know how to do this and wont go through that detail. My AppSettings contains a lot more information than is truely needed, but I like having the portions of the Connection String readily available. Now that I have a class that can access Azure Blob Storage, I needed a controller that jsTree could call from ajax that would return a list of containers, which would have child directories, and potentially files. For those not familiar with Azure Blob Storage, directories are more of a logical construct. They dont actually exists within the blob container. When you place a file in blob storage, and place it in a directory the blob is actually in the form of director/fileName.ext. Fortunately, the Microsoft library provide a CloudBlobDirectory class that can be used to cast your blobs and identify whether they are a directory or not. Next I have created a Storage controller to act as my API. There are 2 methods in this controller, one to get a list of folders for a specific node, and one to get all the contents of a specific node. I seperated these into 2 seperate actions because the expanding and collapsing of the jsTree is handled differently than selecting folder(node) in js tree. There is some magic wrapped up inside jsTree that allows this to work. When you expand a node, it causes the ajax to fire again, with the expanded node being available to pass as data to your method. Since this happens when the node is expanded, your nested directory structure becomes very easy to display. The next thing I wanted to be able to do was display the list of files that are in the selected folder, similar to what you would see in a windows file explorer. When selecting a node, you can capture the selected node event and use that to call a function or make your ajax call. In my case, I am simply calling a function that builds out the file view. It should be noted that you can display these files how ever you like. For my actual users, I am simply displaying a file icon from font awesome, for this demo I am displaying the image that is in the folder. Each of the images are links to the blob appended with a Shared Access Token. I have set the timeout to 5 minutes, but that can be configured in your application. This allows your users to access and download your azure blobs without them needing to actually have access to the storage account. The last thing that I wanted was pure icing. The containers my users access have a number of directories in them. I wanted my users to be able to drill down into a folder from the file list shown above. In order to accomplish this I am triggering a jsTree event that causes jsTree to expand and select the folder, and then update the files that are list. The jsTree events can take call backs, which makes chaining anonymous functions super easy. 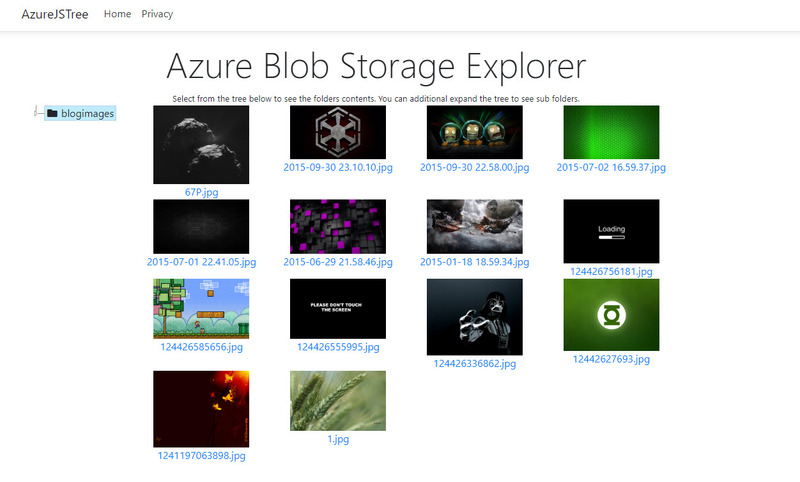 And thats it, you now have a fully function Azure Blob Storage File Explorer.